Cherry tomatoes are at their peak right now and are packed with beta-carotene. And while cooked tomatoes are higher in lycopene than fresh ones, the uncooked ones are still a good source of this nutrient. Several studies have found that people with higher amounts of lycopene in their blood have a lower risk of some types of cancer. Note: I like using a metal mesh grill basket for small items like shrimp. It’s much easier and cleaner than threading the shrimp onto skewers and then having to remove them once they’re cooked. You can probably get a basket on sale now! In a zip-top plastic bag, combine all of the ingredients for the shrimp. Refrigerate for 30-60 minutes. Meanwhile, rub the cut sides of the garlic over the bread slices. Use a pastry brush to coat both sides of the bread with 1 tablespoon of the olive oil. Heat a grill or grill pan to medium high and grill the bread for 1 minute per side; transfer to a cutting board. Leave grill on. In a medium bowl, combine the cherry tomatoes, salt, pepper, balsamic, the remaining 1 tablespoon olive oil and olives. Toss gently. Remove shrimp from the bag with the seasonings (dispose of bag) and either thread on skewers or transfer to a metal mesh grilling basket (see note above) and place on grill. Cook for 2 minutes per side, until pink and opaque. Remove from heat. 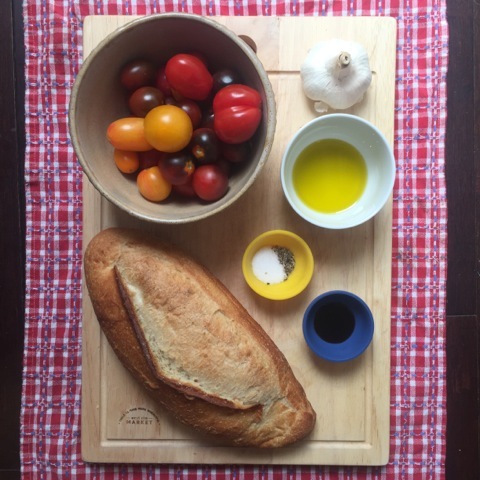 Cut the grilled bread into 1-inch cubes and add to the bowl with the cherry tomatoes; toss. Serve about 10 shrimp and 1 cup panzanella on each of 4 plates.